This image is incredible. 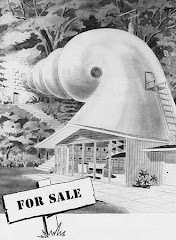 I wish it was wider because that looks like a serious turntable. 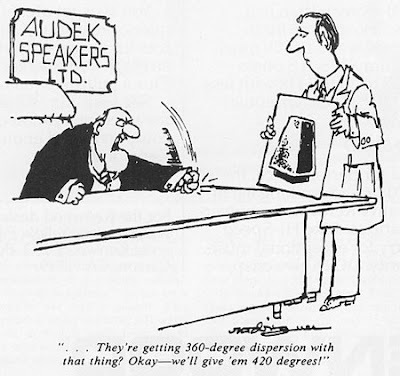 I can see some Fisher gold and the speaker must be an Altec Iconic. 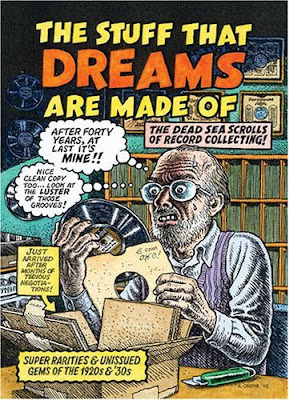 This is a great comic by R.Crumb. He thought if he drew it he would receive it. It is said that he only likes the earliest of recorded music. I've started to look out for early 78's being inspired by a good friend. 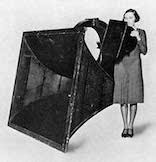 To find mint 78's is almost impossible. 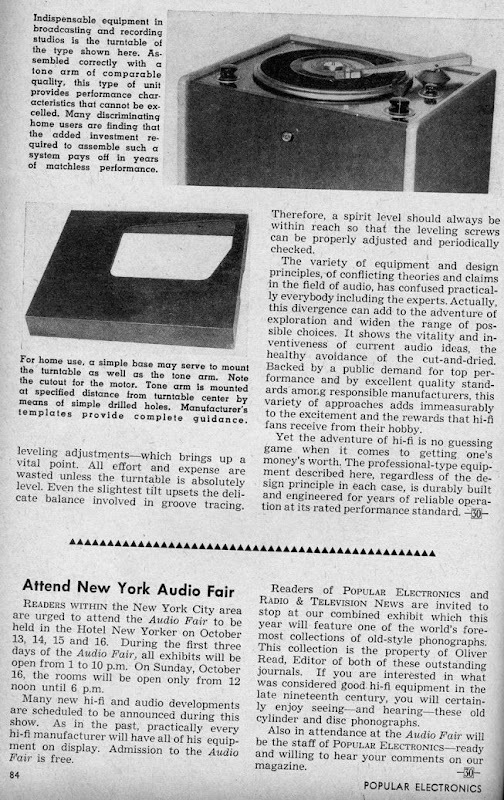 To find clean playable is possible but it is rarely the 78's you want to hear. I did find a Hank Sr 78 recently that plays nice but this was from the end of the 78 era. 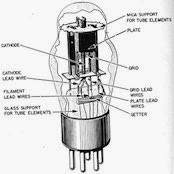 These rough gems of music have also taught me that just because the source is questionable and has lots of surface noise that we should try to listen past these defects and into the music. It is fast becoming my opinion that those that truly love music do not do so at the exclusion of source material but like the music in spite of its source defects. 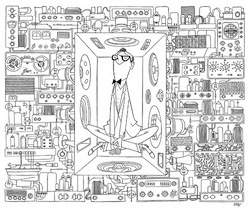 What percentage of music is perfectly clean and recorded? How much of that while is good quality is just not interesting? Antiseptic? 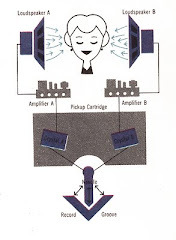 Do not be a slave to the lofty golden ear audiophile standards but rather embrace the music lover standards. 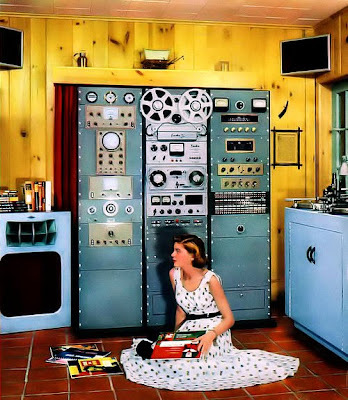 It is easy to just listen to clean recordings but it takes a true music lover to hear past the pops hiss and defects. 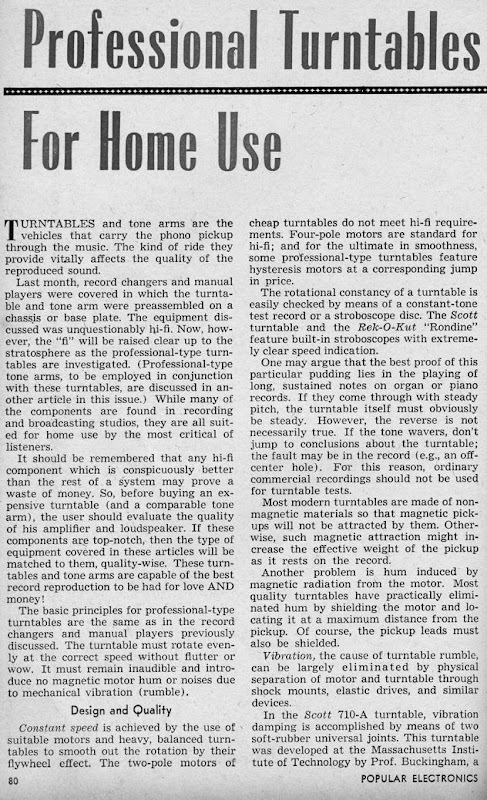 It seems pro turntables in the home is not a new idea. 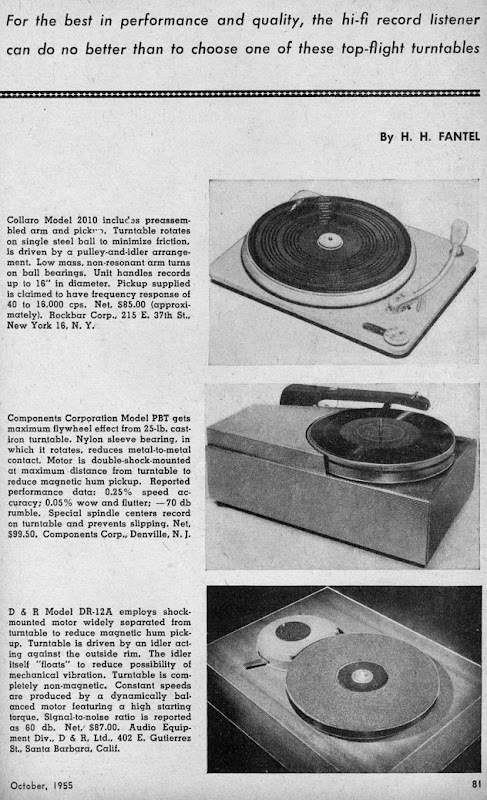 This article has the best turntables from 1955. I hope you enjoy this article as much as I did. Recently I scored a Garrard 301 and TPA12 tonearm for almost nothing at a thrift store. 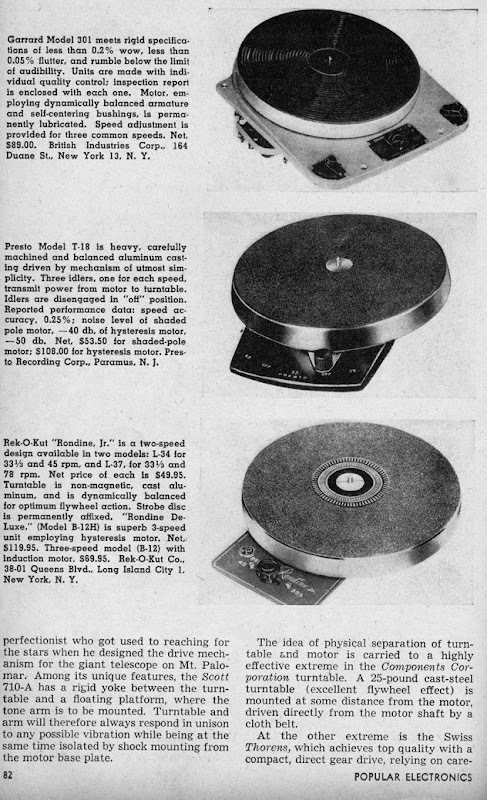 This has led me to investigate vintage turntable technology. One thing is clear and that is not alot has changed and people still argue over the same things. 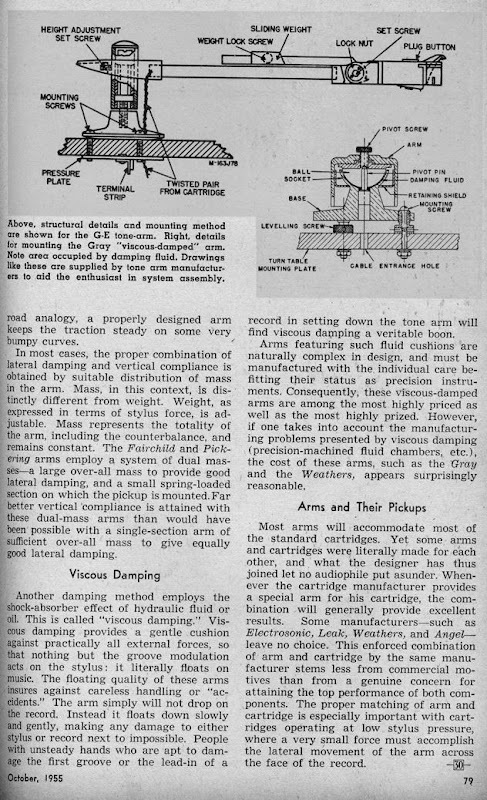 At a thrift store the other day I found a very early popular electronics magazine circa 1955. 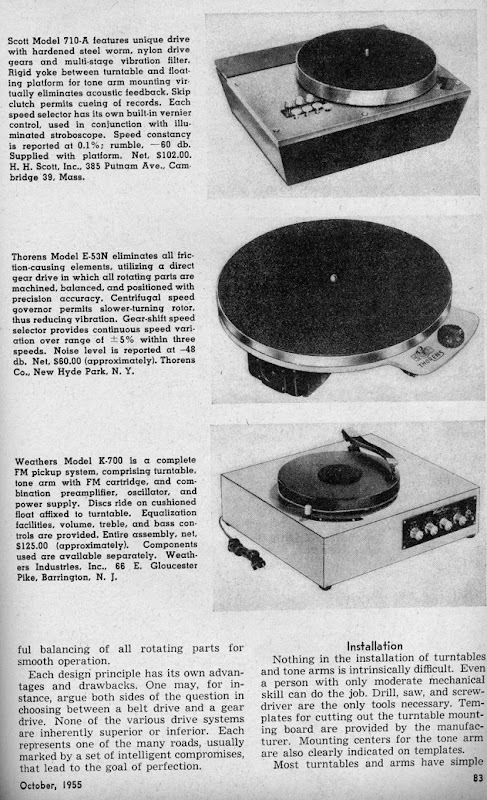 It has some great ads and an even better article on tonearms and pro turntables. This is part one. I hope you enjoy it. 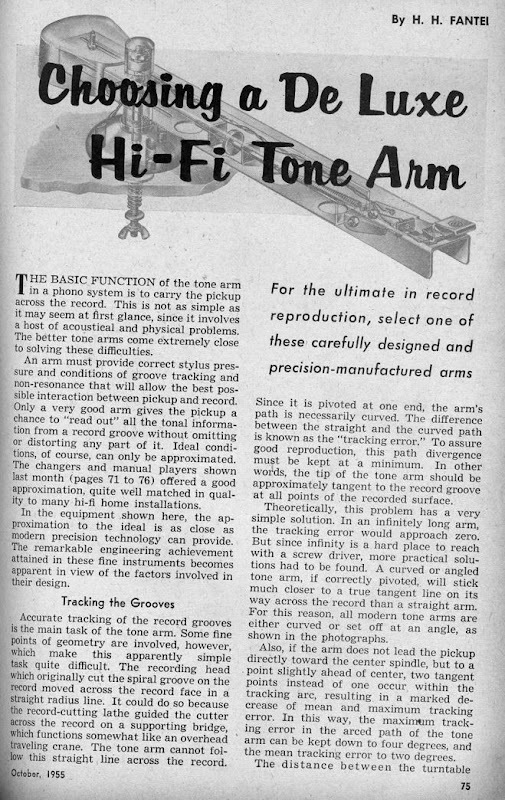 The science of the tonearm has not changed that much. 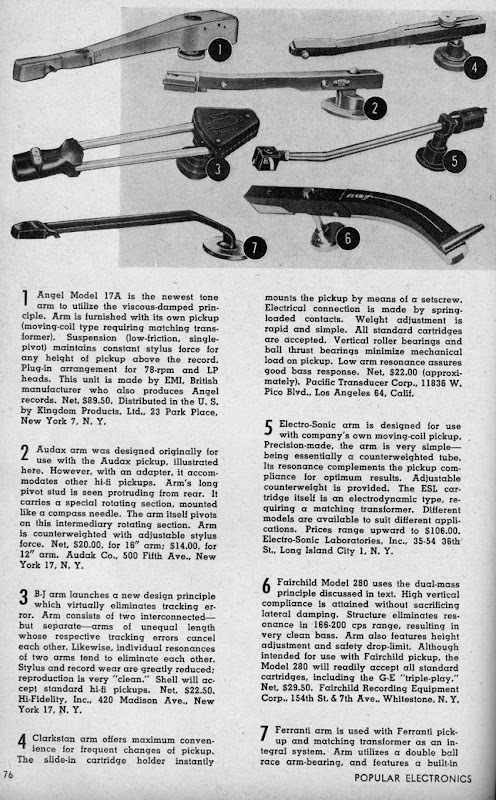 There were so many great tonearms. Most of these are still collected today. 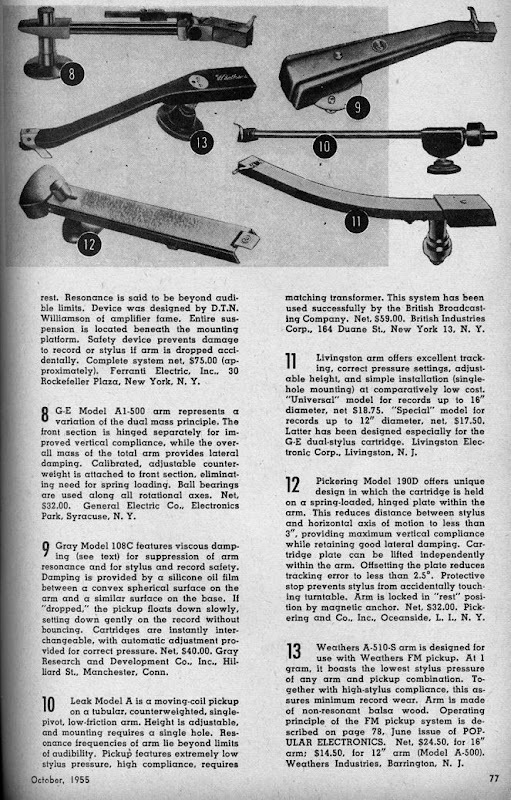 G-E A1-500, Gray 108C, Leak Model A, Livingston, Pickering 190D, and Weathers A-510-S. 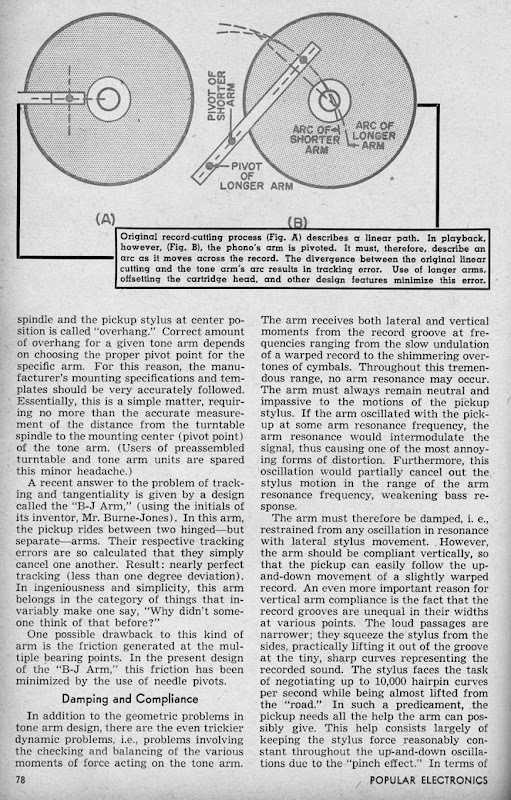 This article even though it was written in the 50's really helped me understand how tonearm and cartridge interacts with the vinyl.